Victor Obinna followed up his weekend hat-trick with two goals as West Ham beat Blackpool to move off the foot of the Premier League table. Keeper Richard Kingson's blunder gifted him the opening goal, before debutant Robbie Keane volleyed in a second. Blackpool's Charlie Adam scored from a corner only for Obinna's rasping shot to make it 3-1 before half-time. Adam thumped a free-kick against the bar as the Seasiders laid siege in the second half but West Ham held on. From the outset, neither side held anything back as they both went all out in attack, and the game developed a lively tempo. Although Ian Holloway's team had the better of the early possession, it was the visitors who did more with the ball when they had it, and the first meaningful chance fell to Obinna. Frederic Piquionne fired in a cross from the left which was allowed to go all the way across the box to Obinna and his bobbling shot drew a good full-stretch from Kingson. Obinna was a constant threat, and with West Ham having clearly identified the right-hand side of Blackpool's defence as a weakness, he was regularly in the thick of the action. When the first goal of the game came, it was no surprise that the Nigerian was involved. He twisted and turned and pulled marker Craig Cathcart out of position, and opened up the angle to shoot from the left-hand corner of the box, with Kingson inexplicably palming the ball into his own net. 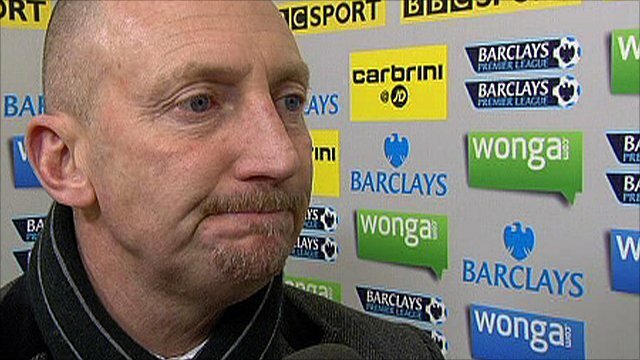 But with the Hammers having shipped 10 goals in their last three league games, Blackpool knew the visitors were open to a sucker punch, and they very nearly landed one through Andy Reid. The Blackpool debutant spotted keeper Robert Green off his line and tried to curl a shot into the far top corner from wide on the right, but the England keeper back-pedalled and managed to finger-tip the ball over the bar. Seeing their lead threatened roused West Ham to action and inevitably Obinna was involved. He drew a fine double save from Kingson but there was nothing the Ghanaian could do about Keane's follow-up volley into the bottom corner from close range. 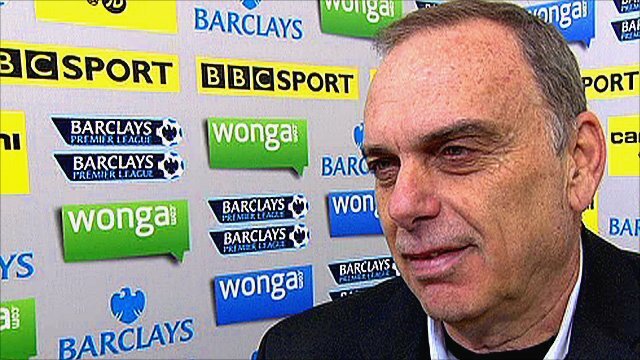 But just as Avram Grant's side were starting to think of the rare luxury of a two goal half-time cushion, Blackpool struck back. Adam, the focus of so much pre-match attention, fired in a low corner from the right which somehow eluded everyone and skidded into the far corner to put the hosts on the scoreboard. Amazingly, there was still time for another goal before the break, and once again, Obinna was at the heart of things. Scott Parker charged forward from the centre circle and laid the ball off to Obinna, who unleashed an unstoppable left-foot shot from 30 yards into the top corner. Adam continued to show his huge value in the transfer market by being at the centre of everything Blackpool did, and he came within inches of narrowing West Ham's lead when he smashed a second-half free-kick against the crossbar. That free-kick was earned after James Tomkins fouled substitute James Beattie and the introduction of the former Everton striker caused West Ham's defence all kinds of problems. Winston Reid in particular struggled to deal with him, and was lucky to avoid conceding a penalty when he hauled Beattie down in the box, although the forward did not complain much about the decision. 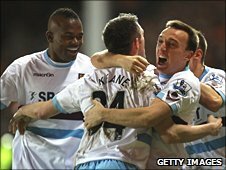 Beattie came on at the same time as former Hammer Marlon Harewood, showing the home side's attacking intent, and they laid siege to Green's goal for the rest of the game. But for all Blackpool's pressure, Green's stoppage-time one-handed save from Harewood was one of the few times he was truly threatened, and the visitors held on for only their second away win of the season. "To be honest I can't wait to get away from home. "All these things are happening in front of our own fans and it is not nice. "So, let's get away, play at Everton on Saturday and see if we can stop the rot." "I am very pleased with how we attacked in the first half - we created a lot of chances. "In the second half we defended very well, which we didn't do in the last games we were winning against Everton and Birmingham. "It was a very important win. Every game now is very important for us. "We wanted to make one step today, we have finished the second third of the league and are starting the last third." 90:00+3:49 The final whistle goes and the game is over. 90:00+2:20 Marlon Harewood takes a shot. Save by Robert Green. 90:00+1:47 The ball is crossed by Neal Eardley, Winston Reid makes a clearance. 90:00+0:27 Corner taken short by Mark Noble. 90:00+0:14 Corner taken short by Mark Noble. 89:42 Mark Noble decides to take a short corner. 89:08 Charlie Adam challenges Frederic Piquionne unfairly and gives away a free kick. Direct free kick taken by Scott Parker. 88:55 Neal Eardley produces a cross, Luis Boa Morte gets a block in. 88:37 The ball is crossed by Dudley Campbell. 88:11 Unfair challenge on Charlie Adam by Gary O'Neil results in a free kick. Richard Kingson takes the free kick. 87:09 Charlie Adam produces a cross, clearance by Wayne Bridge. 87:02 A cross is delivered by Alex Baptiste. 86:46 The ball is swung over by Charlie Adam, clearance by Lars Jacobsen. 86:18 Outswinging corner taken by Charlie Adam from the left by-line played to the near post. 86:05 Neal Eardley produces a cross, Winston Reid makes a clearance. 85:44 Marlon Harewood crosses the ball. 83:32 Substitution Radoslav Kovac on for Robbie Keane. 82:36 Substitution Victor Obinna leaves the field to be replaced by Luis Boa Morte. 82:02 Inswinging corner taken by Charlie Adam. 81:50 David Vaughan takes a shot. Winston Reid gets a block in. 81:28 The ball is delivered by Neal Eardley, clearance made by Lars Jacobsen. 80:59 David Vaughan crosses the ball. 80:48 Centre by Neal Eardley, clearance made by Lars Jacobsen. 80:09 The ball is crossed by Neal Eardley, clearance made by Lars Jacobsen. 78:33 Shot from outside the penalty box by Charlie Adam goes wide right of the goal. 77:26 The ball is delivered by Neal Eardley, Robert Green makes a save. 76:35 Victor Obinna gives away a free kick for an unfair challenge on Neal Eardley. Direct free kick taken by Richard Kingson. 76:02 Short corner taken by Mark Noble. 75:49 Robbie Keane takes a shot. Richard Kingson makes a save. 75:37 David Vaughan concedes a free kick for a foul on Scott Parker. Free kick taken by Mark Noble. 74:53 Scott Parker fouled by Charlie Adam, the ref awards a free kick. Wayne Bridge restarts play with the free kick. Correction - 74:18 Victor Obinna produces a left-footed shot from close in which goes wide of the left-hand upright. 74:18 Scott Parker has an effort at goal from close in which goes wide of the left-hand upright. 73:51 Charlie Adam takes a shot. Mark Noble gets a block in. 72:52 The ball is sent over by Marlon Harewood, Robert Green makes a save. Correction - 72:24 The official flags Robbie Keane offside. Richard Kingson takes the indirect free kick. 72:24 The official flags Robbie Keane offside. Indirect free kick taken by Richard Kingson. 70:40 Scott Parker fouled by David Vaughan, the ref awards a free kick. Wayne Bridge takes the direct free kick. 69:58 The ball is delivered by Marlon Harewood. 68:27 Corner taken left-footed by Charlie Adam from the right by-line to the near post, Frederic Piquionne makes a clearance. 66:18 James Tomkins concedes a free kick for a foul on James Beattie. Strike comes in from Neal Eardley from the free kick. 65:45 Neal Eardley sends in a cross, Winston Reid manages to make a clearance. 64:25 Scott Parker challenges James Beattie unfairly and gives away a free kick. Free kick taken by James Beattie. 63:09 Gary O'Neil gives away a free kick for an unfair challenge on David Carney. Charlie Adam crosses the ball from the free kick left-footed from left wing, Frederic Piquionne makes a clearance. 61:25 James Beattie takes a shot. James Tomkins makes a clearance. 60:55 Robbie Keane is penalised for a handball. Direct free kick taken by Richard Kingson. 60:15 Substitution Luke Varney leaves the field to be replaced by James Beattie. 59:43 Substitution Marlon Harewood joins the action as a substitute, replacing Andy Reid. 58:15 Unfair challenge on Mark Noble by Andy Reid results in a free kick. Robert Green takes the free kick. 58:15 Booking Scott Parker goes into the book for dissent. 55:04 David Vaughan fouled by Scott Parker, the ref awards a free kick. Direct free kick taken by Richard Kingson. 53:10 Victor Obinna fouled by Charlie Adam, the ref awards a free kick. Direct free kick taken by Robert Green. 50:18 The ball is sent over by Gary O'Neil. 50:06 Robbie Keane produces a cross. 48:26 Corner from the right by-line taken by Charlie Adam, Header from deep inside the area by Alex Baptiste goes over the bar. 48:10 Andy Reid takes a shot. Blocked by Scott Parker. 48:07 Neal Eardley delivers the ball. 47:33 David Vaughan takes a shot. Robert Green makes a save. 47:10 Charlie Adam takes the inswinging corner, clearance made by Frederic Piquionne. 46:48 Foul by Winston Reid on Luke Varney, free kick awarded. Luke Varney restarts play with the free kick. 45:45 The assistant referee flags for offside against Luke Varney. Free kick taken by Robert Green. 45:01 Substitution Ian Evatt on for Craig Cathcart. 45:00+3:06 It is the end of the first-half. 45:00+1:11 Unfair challenge on Charlie Adam by Gary O'Neil results in a free kick. Direct free kick taken by Richard Kingson. 45:00+0:31 Corner taken by Andy Reid. 45:00+0:09 Lars Jacobsen challenges Dudley Campbell unfairly and gives away a free kick. The free kick is delivered left-footed by Charlie Adam from left channel. 43:11 Scott Parker provided the assist for the goal. 43:11 GOAL - Victor Obinna:Blackpool 1 - 3 West Ham Victor Obinna scores a goal from outside the penalty area to the top left corner of the goal. Blackpool 1-3 West Ham. 41:42 GOAL - Charlie Adam:Blackpool 1 - 2 West Ham Goal scored by Charlie Adam from just outside the box to the bottom left corner of the goal. Blackpool 1-2 West Ham. 40:33 Charlie Adam fouled by Scott Parker, the ref awards a free kick. Shot on goal comes in from Charlie Adam from the free kick, Scott Parker makes a clearance. 36:33 Assist by Victor Obinna. 36:33 GOAL - Robbie Keane:Blackpool 0 - 2 West Ham A goal is scored by Robbie Keane from close in to the bottom right corner of the goal. Blackpool 0-2 West Ham. 36:16 Victor Obinna takes a shot. Save by Richard Kingson. Victor Obinna takes a shot. Save made by Richard Kingson. 36:01 Free kick awarded for an unfair challenge on Scott Parker by Craig Cathcart. Mark Noble takes the free kick. 35:46 The ball is swung over by Gary O'Neil, save made by Richard Kingson. 34:50 Outswinging corner taken by Andy Reid from the left by-line, Header from deep inside the penalty area by Alex Baptiste goes harmlessly over the crossbar. 34:36 Andy Reid delivers the ball, save by Robert Green. 34:30 The ball is sent over by Andy Reid, James Tomkins makes a clearance. 33:37 Free kick awarded for an unfair challenge on Gary O'Neil by Luke Varney. Wayne Bridge delivers the ball from the free kick left-footed from right wing, clearance by David Carney. 32:48 Substitution Winston Reid replaces Daniel Gabbidon. 31:48 The ball is sent over by Andy Reid. 31:13 A cross is delivered by Charlie Adam, Mark Noble gets a block in. 30:33 Charlie Adam takes a short corner. 30:26 Luke Varney crosses the ball, clearance made by Wayne Bridge. 28:04 The ball is delivered by Wayne Bridge, save by Richard Kingson. 26:38 The ball is sent over by Gary Taylor-Fletcher, Frederic Piquionne makes a clearance. 26:02 Gary O'Neil is adjudged to have handled the ball. Free kick taken by Charlie Adam. 25:23 James Tomkins concedes a free kick for a foul on Charlie Adam. David Carney takes the direct free kick. 24:43 The ball is crossed by Gary O'Neil, Alex Baptiste manages to make a clearance. 24:12 Unfair challenge on Victor Obinna by Neal Eardley results in a free kick. Wayne Bridge restarts play with the free kick. 23:04 Wayne Bridge provided the assist for the goal. 23:04 GOAL - Victor Obinna:Blackpool 0 - 1 West Ham A goal is scored by Victor Obinna from close range to the bottom left corner of the goal. Blackpool 0-1 West Ham. 22:32 Inswinging corner taken from the right by-line by Wayne Bridge. 22:05 Corner taken by Mark Noble from the left by-line played to the near post, clearance made by Luke Varney. 21:58 The ball is sent over by Wayne Bridge, Craig Cathcart gets a block in. 21:13 Scott Parker has shot on goal from just outside the box which goes wide of the right-hand upright. 20:52 Mark Noble takes a shot. Alex Baptiste gets a block in. 19:12 Mark Noble gives away a free kick for an unfair challenge on Dudley Campbell. Direct free kick taken by Richard Kingson. 18:18 The ball is sent over by Mark Noble, Charlie Adam makes a clearance. 17:52 Corner taken short by Mark Noble. 16:24 The assistant referee signals for offside against Dudley Campbell. James Tomkins takes the indirect free kick. 16:03 Scott Parker takes a shot. Blocked by David Vaughan. 15:39 The ball is sent over by Victor Obinna, Alex Baptiste makes a clearance. 15:14 David Carney is penalised for handball and concedes a free kick. Free kick taken by James Tomkins. 14:26 Andy Reid produces a cross. 13:21 Robbie Keane is caught offside. Richard Kingson restarts play with the free kick. 11:44 The ball is sent over by Lars Jacobsen, David Vaughan makes a clearance. 10:54 A cross is delivered by Wayne Bridge, clearance by Alex Baptiste. 10:50 The ball is swung over by Victor Obinna. 10:21 Victor Obinna sends in a cross, Richard Kingson makes a save. 9:40 Andy Reid crosses the ball. 8:35 Neal Eardley produces a cross, Robert Green makes a save. 7:26 A cross is delivered by Andy Reid, clearance by James Tomkins. 4:47 The ball is crossed by Charlie Adam, clearance by Daniel Gabbidon. 4:14 Andy Reid has shot on goal from just outside the area which goes wide of the right-hand upright. Correction - 4:02 The ball is sent over by Charlie Adam, Daniel Gabbidon manages to make a clearance. 4:02 Charlie Adam delivers the ball, clearance made by James Tomkins. 3:20 Gary O'Neil takes a shot. Save by Richard Kingson. 3:02 Victor Obinna takes a shot. Save made by Richard Kingson. 2:55 The referee blows for offside. Free kick taken by Robert Green. 2:09 Gary Taylor-Fletcher takes a shot. Wayne Bridge gets a block in. 0:43 Corner taken by Andy Reid from the left by-line to the near post, clearance made by James Tomkins. 0:25 Andy Reid sends in a cross, Mark Noble gets a block in.